A full skincare routine with a tablet? 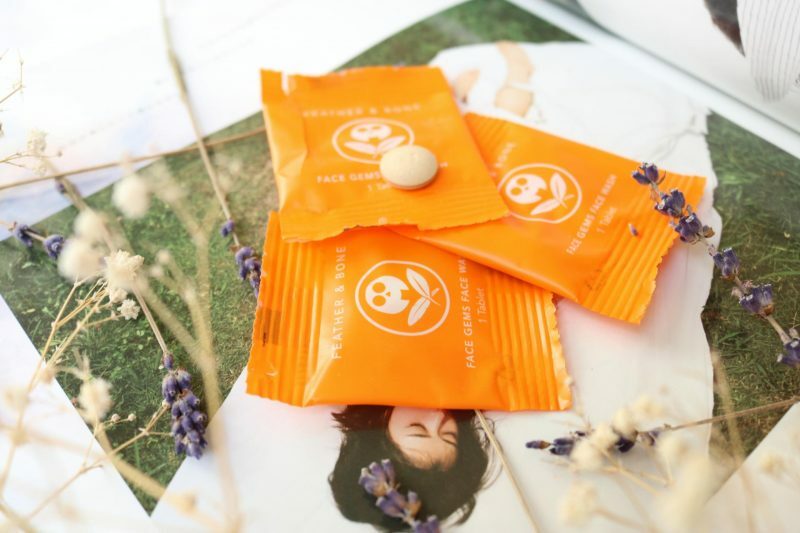 Feather & Bone Face Gems Face Wash! Sometimes I discover new products that totally blow my mind. That doesn’t happens a lot these days because I almost tried and see everything. A while ago Brittany of Feather & Bone approached me with the question if I was interested to try the Face Gems. After a quick look at their website and Instagram I became super curious so I said yes! Oh men, this might me the most simple but amazing cleansing product I’ve ever tried! A great cleanser doesn’t have to be super difficult with a beautiful packaging or scent (sometimes it makes the experience more fun). If you are looking for something easy, simple and honest that cleanses your face you have to continue reading my review! So what is the Face Gems Face Wash exactly? It is a simple face wash tablet made of 3 simple ingredients: Fuller’s Earth(clay) to cleanse and exfoliate your skin, Sandalwood that protects the skin from the environment and Corn Starch to moisturize and hydrate the skin. 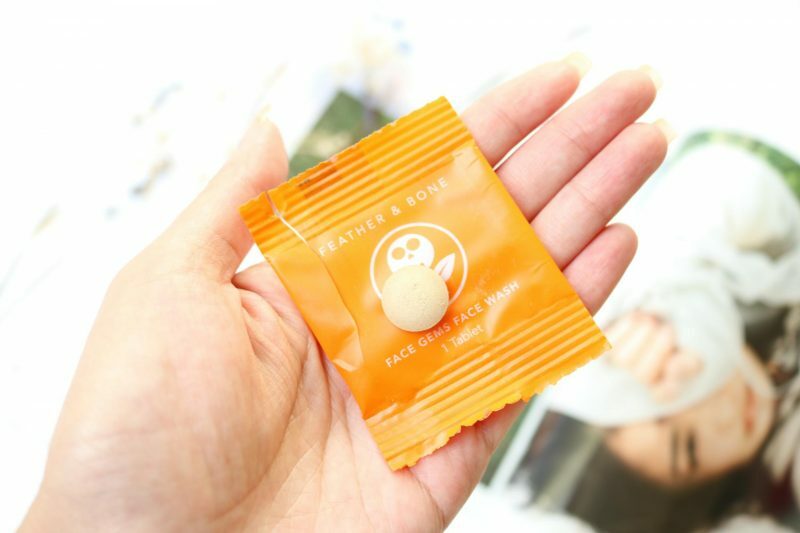 A busy girl like me (you also can call me lazy) sees many benefits with this face wash tablet. No need for a multi face routine when you go to bed. This tablet does all your skincare steps in just one: cleanse, exfoliates and moisturizes. Tell me, did you ever tried anything that had all of these steps in one? 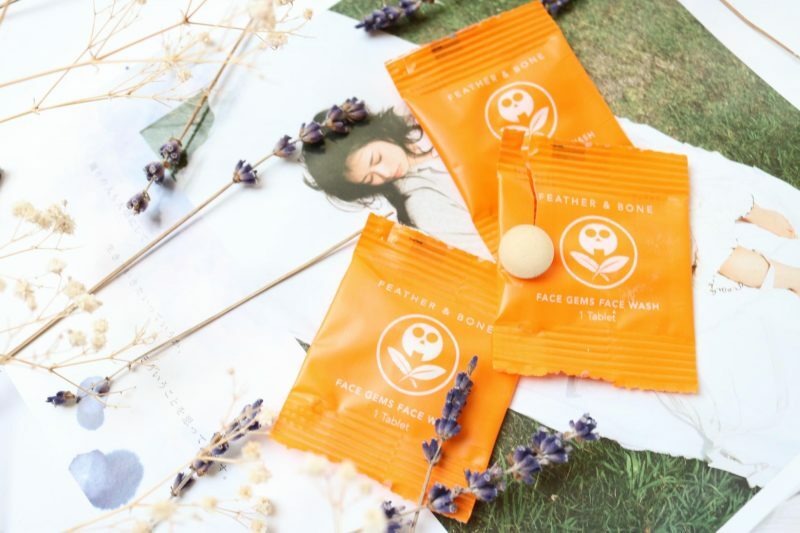 Pssst, did I already told you that Feather & Bone Face Gems only uses the highest quality ingredients in their purest natural form? No wonder that Feather & Bone as invited to the United Nations Green Fair 2016! 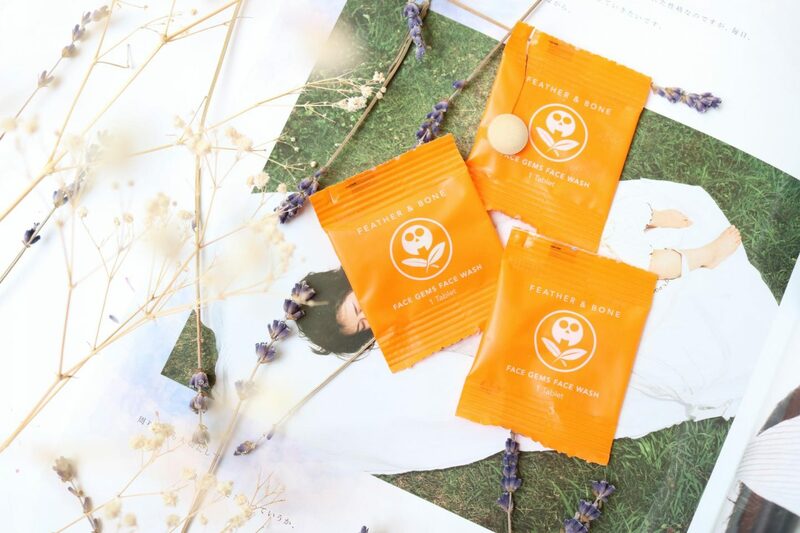 The ingredients of the Face Gems Face Wash are so pure, that you can put them back into the earth without harming the environment. 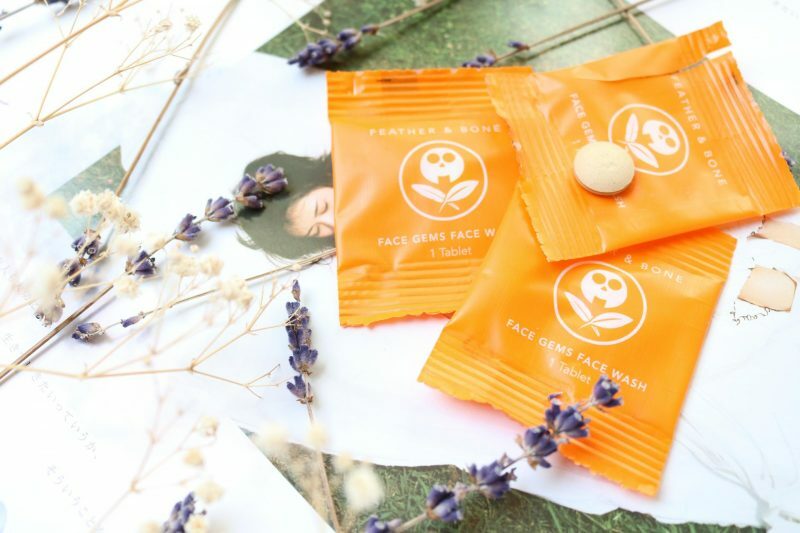 How to use the Face Gems Face Wash? Add 5 to 10 drops of water on the tablet. When the tablet starts to get darker and soaked al the water, apply some pressure on the tablet to break and dissolve it. When you start rubbing your hands the tablet will change into a paste. After you massaged your face, rinse your face to start feeling the refreshing effect of the Face Gems! I wish I had these face wash tablet while I was in Japan. Think of it again, this will save so much space AND weight in your suitcase while you are travelling. More space for new things during your trip! Each tablet is packed in a separate plastic wrap so it will stay fresh. It is easy to prepare yourself when you go away because each wrap means one cleanse. Don’t forget that this cleanser contains no liquid so you can easily throw it in your hand luggage without having to worry that it doesn’t fit your see-through liquid bag while checking in at the airport. At first I was really skeptical: a tablet that cleanses, exfoliates and moisturizes your skin. It sounds too good to be true. My expectations were that it did cleanses my face but not with the same results as my most favorite cleansers. The exfoliation was something I did believed because I saw that clay was one of the ingredients which is well-known. After a quick Google research about the ingredient Sandalwood I believed that it also will work great for the skin to protect it from the environment. Let’s start trying it out! I used my very first Face Gems Face Wash during one of those nights that I fell asleep while I was watching TV. I suddenly woke up because my contacts started to try out in my eyes. I realized that I still had my makeup on (worst feeling evaaaa). This was the moment to try out the tablet to have a full skincare routine within one step so I could easily hop back to bed after I washed my face. I grabbed my camera to capture how the tablet changed. First and most important thing is that it was very easy to open the plastic wrap, very important because sometimes those plastic things can be a real struggle. I didn’t catch any weird fragrance from the plastic wrap when I opened it. The size of the tablet looks reasonable to be, but we have to see how much the amount is when it changes into a paste. I added a few splashes of water (nobody that can count drops when they are half awake/asleep) on the tablet and it started to change color. I putted some pressure on the tablet with my finger to see if I added enough water. I did, it instantly dissolved into small pieces. With some circular motions the pieces changed into a soft paste. I used both hands to massage the paste on my face and neck. 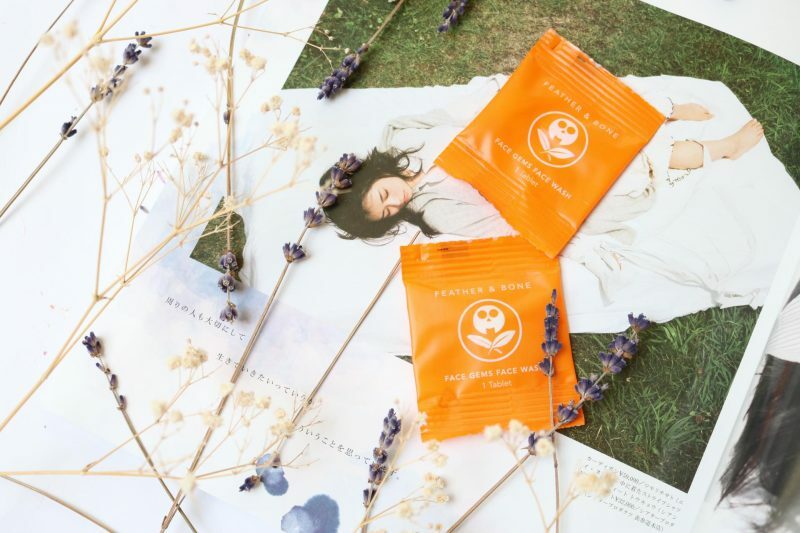 The tablet has the right amount of product to fully cleanse your face and neck! I even had the feeling that it was maybe too much, but while I massaging the product on my face I felt it was the perfect amount to do my whole face during the routine. I cleansed my face with lots of water and I instantly noticed how clean my face felt after I used the towel. My face feels clean and fresh. I checked with a cottonpad and toner if the tablet didn’t left any residue on my skin. It was super clean, no residue or other dark dirt on my face. The skin doesn’t feel dry or pulling, it almost feels like I used an oil cleanser because the skin is super soft, smooth and moist. I can’t see that it gives the same effect as a real moisturzer, but the skin feels more moist than other regular cleansers (beside the oil cleaners). I have to admit that my skin was a disaster after I came home from Japan, it really needed some TLC. 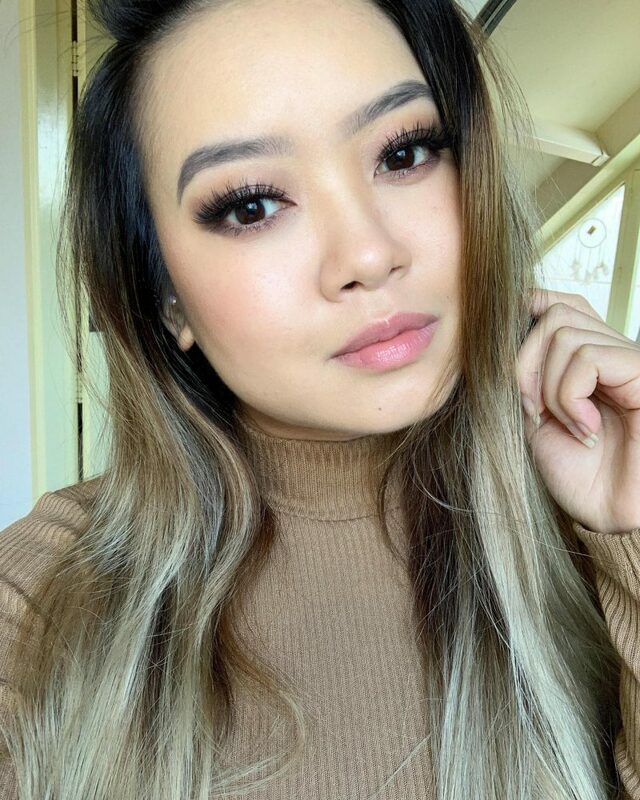 It took a while before my skin was back to normal but I could really feel after using the tablet that my skin felt softer. 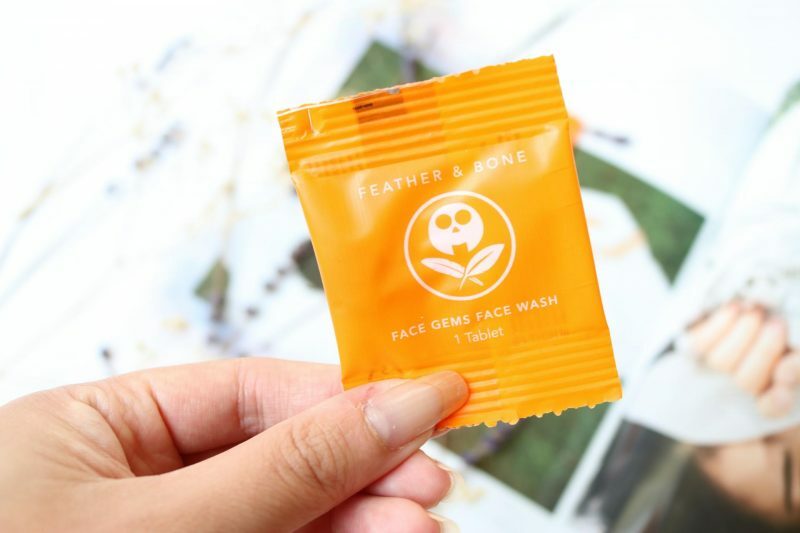 We can all agree that the Face Gems Face Wash is travel friendly because you can easily take it with you on the go because of the plastic wrap, no liquid and no spillage. The plastic will keep the tablet fresh until you open it for you all-in-one face routine: cleanse, exfoliate and moisturize. It is great to know that such a simple product is produced with pure ingredients that doesn’t harm our world. No more long lists of ingredients! Just three important ingredients, no more. I can say that it was more than I expected. This little tablet has so much more to offer than you think. My skin felt instantly soft and clean, the skin looked more even and after washing my face it felt calm and moist. Everything what they promised did work for my skin! Is it worth the try? Absolutely! 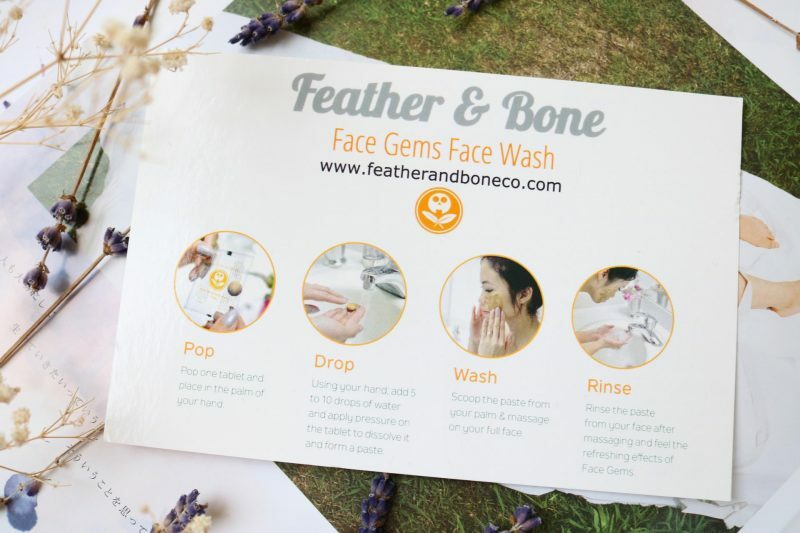 You can try your own Feather & Bone Face Gems Face Wash now! Head over to their official website to see you can get your hands on it. Looks so convenient to use! Love your pictures!